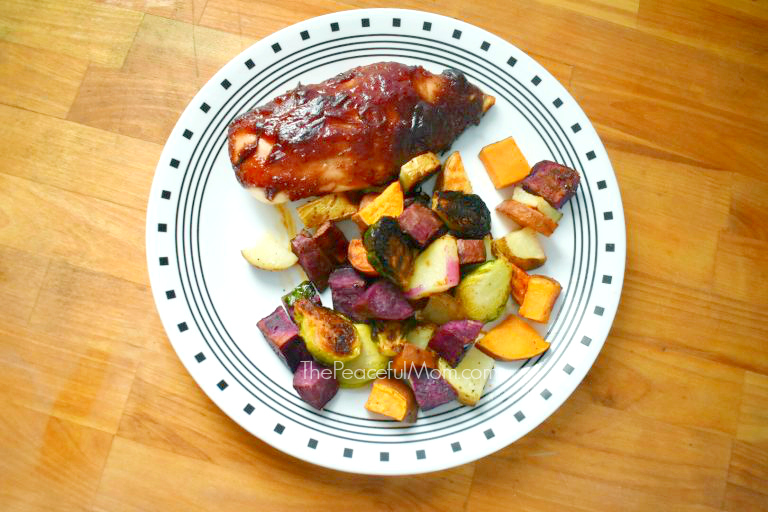 Super delish roasted chicken and vegetables dish in one pan for easy clean up! With all the hustle and bustle of family festivities, easy meals are a must have. 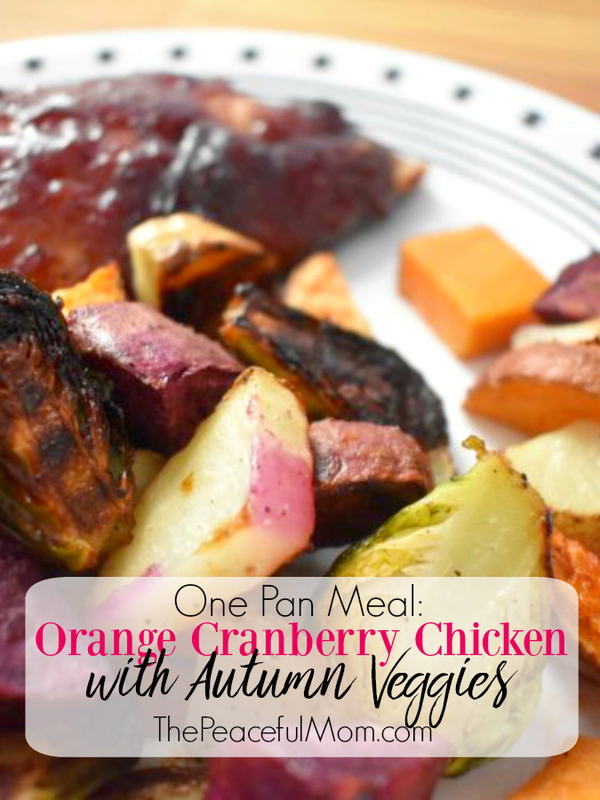 This One Pan Orange & Cranberry Roasted Chicken with Vegetables dish is a perfect seasonal dinner that tastes like a Thanksgiving meal, with only a fraction of the work! Dinner can be ready in under an hour. 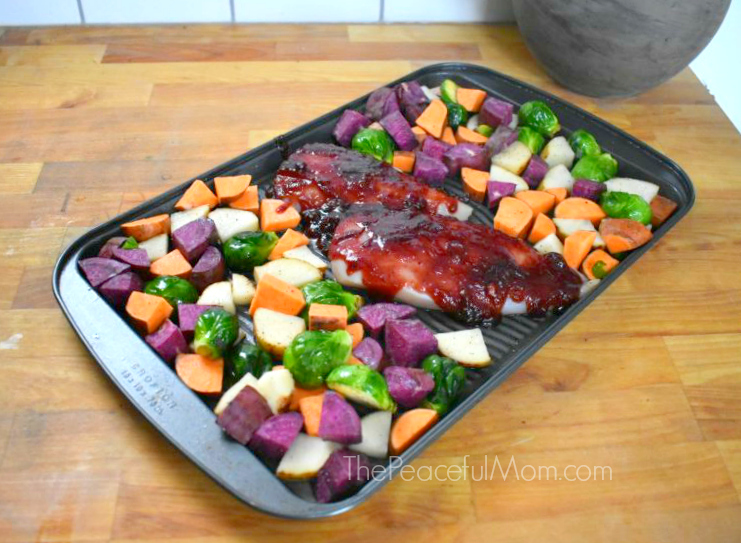 This meal was so yummy and very easy to make! If Fall had a flavor or a staple meal, I think this would be it. The Orange Cranberry glaze is sweet and tangy with a little bit of spice. 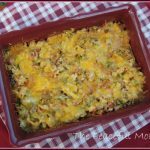 It pairs so well with the robust flavors of the potatoes and brussels sprouts. To start, I prepped all of my ingredients before cooking. This allows me to combine ingredients much faster. Honestly, the most prep work you’ll have is zesting an orange and cutting up your veggies! 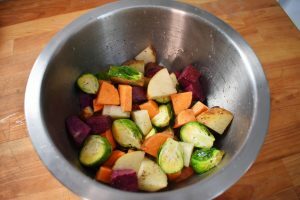 After everything is prepped and ready, I tossed the veggies in a bowl with some olive oil, salt and pepper, then placed them on a cookie sheet and set them aside. 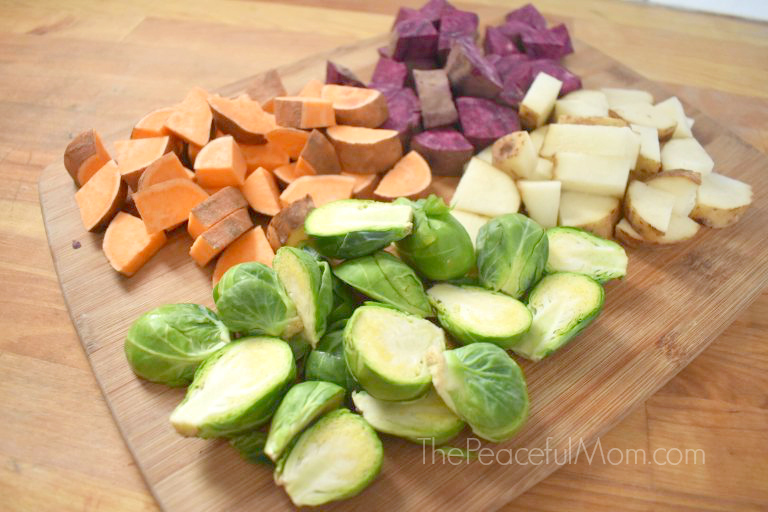 I just love how colorful these potatoes and brussels sprouts look! 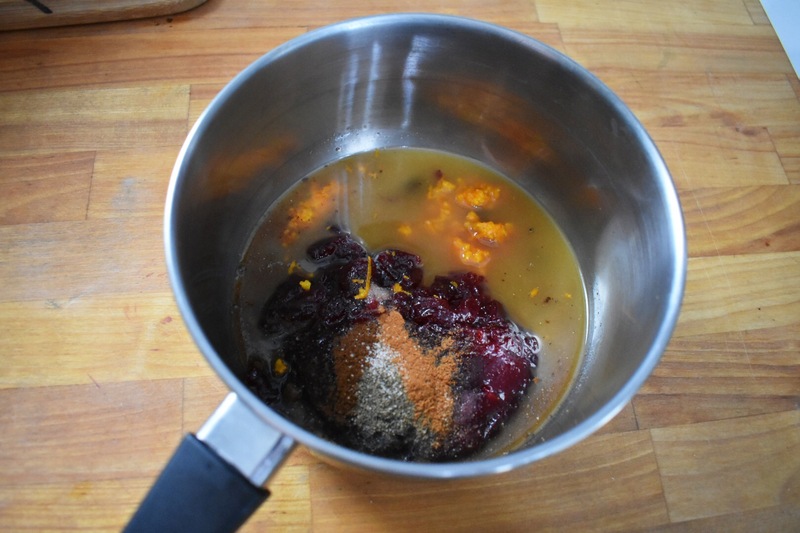 Next, simply combine all the glaze ingredients in a saucepan, mix together and cook on medium heat. Once the mixture starts to boil, allow it to simmer for about ten minutes, stirring often. The goal is for the liquid to boil off and your sauce to thicken. It should end up looking like jam after about ten minutes. Once that’s done, scoop some out onto the chicken breasts, enough to cover the top pf each breast. Leave the extra in the pan, it’s great for extra topping later on! Now that your pan is ready, pop it in the oven for 30-35 minutes at 400℉. That’s it! 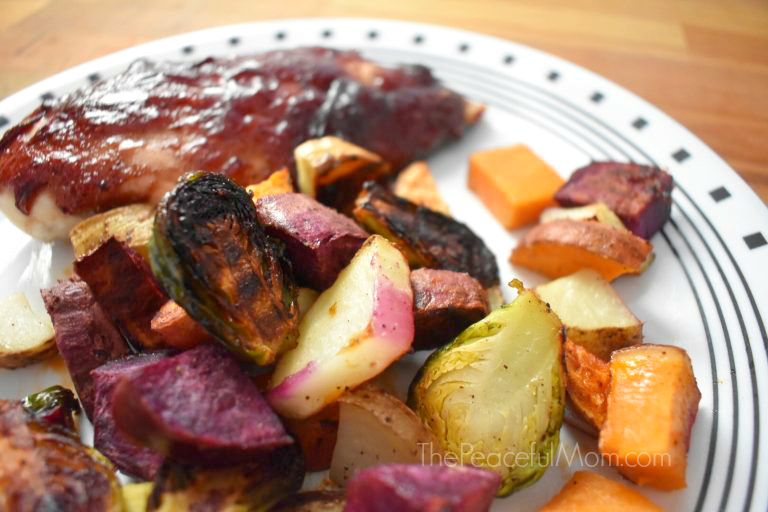 An easy seasonal dinner! Pre-heat oven to 400 degrees Fahrenheit; spray cookie sheet with a light layer of non-stick spray. Prep ingredients and cut vegetables. Toss vegetables in 2 tablespoons of oil and add salt and pepper to taste; spread veggies on the cookie sheet. Put chicken breasts on the same cookie sheet and set aside. To make the glaze: Combine all of the glaze ingredients in a saucepan, stir and cook on medium heat. Once mixture starts to boil, allow it to simmer for 10 minutes, stirring often until sauce thickens. Spoon out some of the sauce and cover the tops of the chicken breasts. If there's leftover sauce, it makes a great extra topping after cooking! Cook for 30-35 minutes at 400 degrees Fahrenheit. More Simple & Delish Recipes!